I serve Sir Edgar Louis, one of London’s wealthiest bankers of my time. As his most trusted steward, I take care of all his matters. I know everything about the man and have become very fond of him. He is nearly sixty years old now – an admirable man who never let the death of his wife dampen his position in society as a shrewd businessman. In my three years of serving him and faithfully looking out for him, I knew that I had earned his trust and confidence. I gave him the best advice and Master Louis always listened to me – until he met Prince Gregor MacGregor. From the onset, I did not like the man. It might have been his strong Scottish accent or maybe it was his persistent request for people to call him “Grand Prince” or “Cazique” – as the natives of his country would address him. This strange character told many fascinating tales from his time as a colonel in the Royal Navy, all the way to the point where he was made a Grand Cazique of the country of Poyais. Everyone listened in awe to the charming prince. “Poyais is a beautiful land. She has white, sandy beaches and lush greenery,” I heard Prince MacGregor say as I positioned myself behind Master Louis. I watched as Master Louis sat up in his chair when MacGregor began describing to us the fertility of the land of Poyais. Unlike other lands that most of the wealthy men had invested in, the fertile land of Poyais could yield an impressive seven crop harvests in a single year! Then, there were gold and silver mines all over Poyais that were still unclaimed. MacGregor explained that the only thing the land desperately lacked now were settlers and investors who would come in and develop his land. 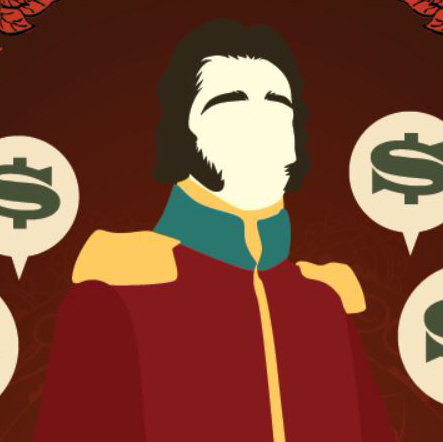 “Poyais needs you,” the MacGregor said, letting his voice trail off to let the wealthy men in the room make silent calculations in their heads of the profits that Poyais would return to them with each bond they could purchase from the charismatic prince himself. By the end of the night, all of London’s great men of influence and wealth were taken up by the prince. More than half the ballroom were eager to buy their investment bonds and there were even plans to charter a ship that would bring settlers to Poyais. They too, were ready to see the land for themselves. From the back of the room, I heard Sir Arthur, a respected lawyer who worked in East London ask if the prince had a map of the land to show them. Everyone agreed it was a good deal – even master Louis was nodding happily to himself in his seat beside the mayor of London who was already giving instructions to his steward to make his payments. I was perhaps the only one in the room who still held a strong dislike for the Prince of Poyais. My only consolation was that the night would end soon, and I would never have to see the pompous prince again. The end of the night came quickly enough. With my master’s coat draped over my arm, I stood waiting for him as he bid farewell to his hosts. Much to my irritation, which I masked very well, Prince MacGregor began talking to my master.